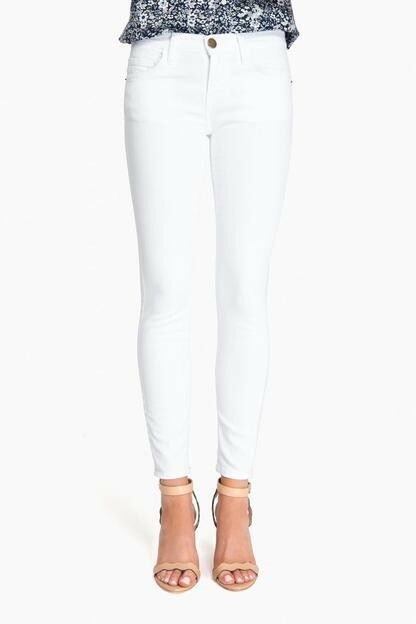 X-Small: 0-2, Small: 4-6, Medium: 8-10, Large: 12-14Boxy fit throughout the bodyModeled in size X-SmallModel Measurements: Height 5'10", Waist 25", Bust 32", Hips 33.5"
Just a perfect white one-shoulder top! It's a bit blousy so I'd suggest going with your smaller size. 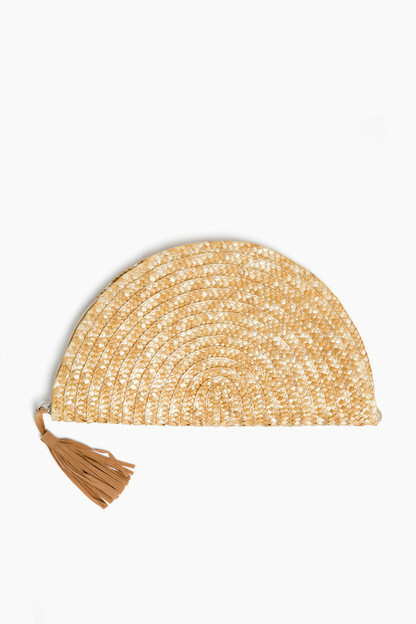 Wear it with shorts, white jeans or almost anything! This top is so very simple and yet so pretty! 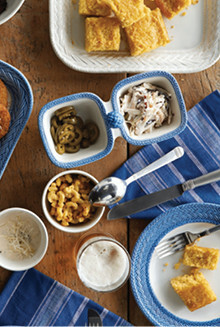 It can be dressed up or paired with jeans. As for fit - the small was a little big for me, so I had to have it altered. It now fits perfectly and I am looking forward to wearing it! Perfect top crisp white top and nice variation to my white top obsession! And, can't beat the price point. Loving it most w White jeans and my fav tnuck earrings! Very cute top - love it for a fun date night. Runs very large - I could have done an XXS, if that was an option. Not too large that I have to return it, but would have liked it a bit more true to size. For reference, I am 5' 4'', 113 lb. I put it with skinny white jeans and it was a great outfit. Love the top, runs big. I ordered a medium and elastic is a little loose. I thought this ran true to size and the ruffles aren't overwhelming. Really pretty to throw on with jeans or dress it up with heels. 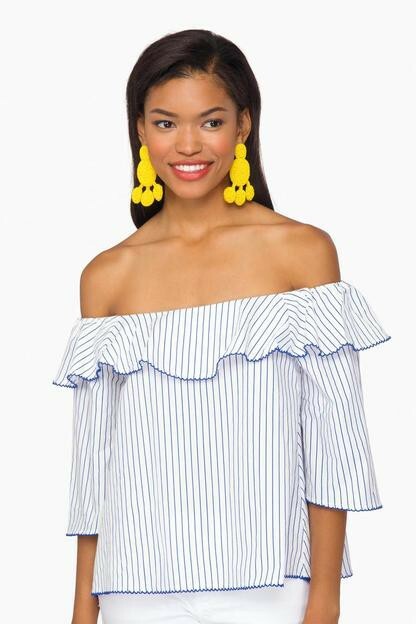 The perfect summer top! This top is super cute however the arm holes are really big. I'm keeping it and will have it tailored because the smaller size is sold out. The fit on this top is just perfect (very tts) - beautiful top, sure to be a summer favorite! I love the top, but the shirt is not true to size. I ordered a Small and it was way too big in the armhole but was the right length. Disappointing as I was excited to wear this for spring. Bought this top for a recent trip to Cancun. It's super cute and didn't get too wrinkled in my suitcase. I'm tall (5'11") and a medium more than covered my midsection. It runs a bit big in my opinion; more of an 8 - 10 than 6 - 8. I am 5 ft approx 115 lbs and typically wear petite. I thought the XS would be fine, but it was still large on me. I love the top however, and decided to have it altered to make it work. Cute eyelet top for Spring! Great price. Definitely runs wide across the chest area. Liked the top more than I thought I would. Material is a little thin, light and airy, but not see through. This top is adorable but I found it to run a little large. I normally wear a small and would need an x-small. I love this top and I feel like it fits true to size. I'm excited to add it to my spring and summer wardrobe! I ordered a med since the model was wearing a small, but its huge on me and very wide. I will be exchanging it, hoping the small isn't so wide! Lovely one shoulder top! I know I will be wearing this quite a bit when the warmer weather arrives. I ordered a medium and it was slightly roomy in the bust area. I could have ordered the small, but it was sold out! 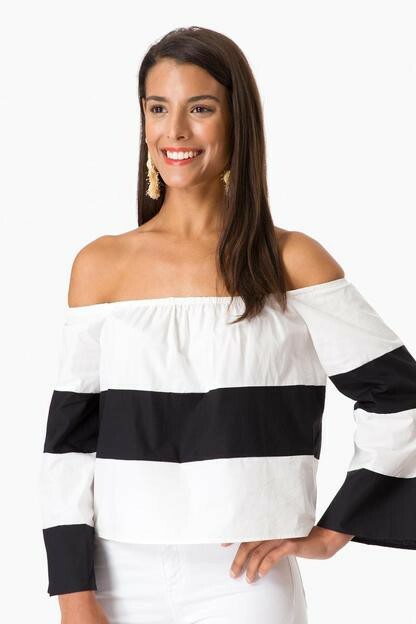 This top is perfect - the lines are clean, it's fitting but not too tight, the eyelet is subtle and sweet, the material is perfect for warm weather. If you order a size too big the angle can go a little too far below the arm, but in the right size the angle is perfect. 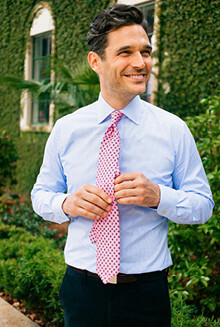 This is a wonderful shirt for the Spring and Summer months. Looks great with everything and is a great backdrop for some fun earrings. Great top! I ordered the small and medium... Small fit perfectly! I usually like a more full fabric top (I have 2 babies, who can blame me?!) but was pleasently surprised to find myself needing the smaller size. It's very flattering and has just the right drop length to add a slimming effect on your arms. Can't wait to wear it this summer! Great white top for summer! Relaxed, easy fit. Can't wait to wear! Super cute top but definitely runs very large. I really loved this top but a size small was really big, and I have a full bust. I would have tried the xs but it was sold out. Too bad! This is such a fun piece! It does run a little big but still cute even a little big! 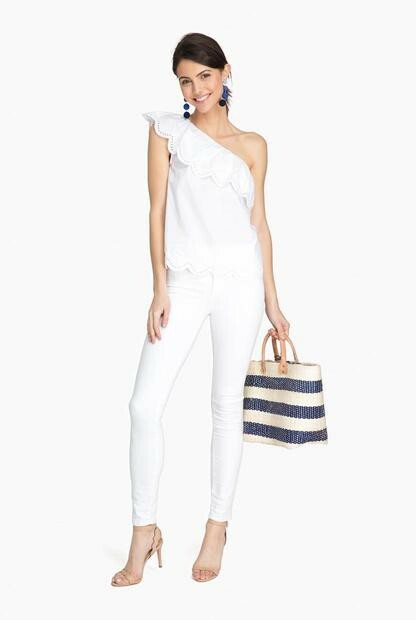 I am in love with the White Aria One Shoulder Top and I am counting down the days until spring! It is the perfect combination of preppy and feminine. The eyelet is delicate and the scallops add a lovely flounce. I will be pairing this with the Kieran Ombre Drop Earrings. It did run a bit boxy on me so I will have it tailored slightly on the sides. Length was perfect. For reference I am 5'4" and 115lbs and I purchased the XS. Adorable but runs on the bigger side. I'm kind of in between sizes (small/medium) and the small fits perfectly. Elegant and crisp. I LOVE this top !! I ordered it for a cruise and it looks great with shorts, jeans, or even a skirt ! Easy to pair with casual or more formal attire !! The top is super cute in person but it gaps a little bit at the left bust line. I bought a small and I'm pretty narrow in the shoulder chest area. XS may fit better. Precious top, will be really cute with shorts or jeans! Super cute top! The material is a bit thin, but the fact that it's not fitted helps. Ordered a small and it fits perfectly! Amazing top with such cute details. There is no zipper and runs a little big. I had mine taken in and it fits perfect. This is a go to top for sure! I recommend sizing down one size. I usually wear a medium (5'5, 130lbs, 34DDD) and I needed a small in this top. Usually ruffles make my already large chest look bigger but this is the first top to lay nicely and not look boxy. Goes with everything, fabric is the perfect weight, not heavy, not thin. A must buy for spring and summer!!! Adorable top. Runs big Though. May need to have the elastic tightened so it doesn't fall down. Fits true, easy top to be dressed down or up. I live in Florida and this shirt is perfect for our summer weather. Fits true to size. This top is very sweet and delicate! I love the fact that it is not too tight and is very comfortable. The only downside is it is a tad thin in material. The fact that it is loose in the body helps that however it does limit where this top is appropriate to wear. Really cute top but runs large. Hoping the x-small will be back in stock soon so I can exchange! Love the fresh white eyelet- will be fun with jeans (white or colored) this Spring/Summer. Runs a bit large. Thought it was cute but too see-through when I actually received it. Ended up returning! I ordered an extra small, but needed to get it altered as it was too wide. Cute, Runs large, Im normally a 0-2 and the XS is big but wearable and very flattering! I ordered this in an x-small and I'm usually a small/x-small and it was quite large. The top is really cute and a great length, it is just really wide. If you can size down further, do. I'm having mine taken in. I loved this top online and was excited to receive. I ordered the X-Small and it looked and fit as if it was a Medium. I would have to get at least 2 inches taken in for it to fit. I normally wear an x-small/small for reference.